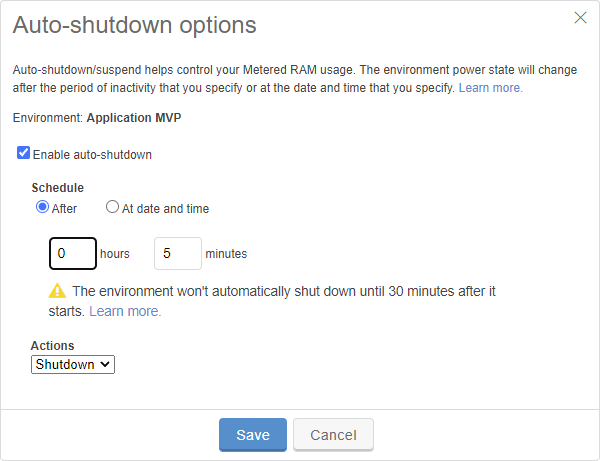 You can configure power options to automatically shut down or suspend an environment after all of its VMs have been idle for a period of time. This helps you control SVM usage for your account. When an environment is shut down or suspended, its VMs do not consume SVM hours and it does not count toward your concurrent SVM limit. To check if VMware Tools is installed on a Linux VM, see Installing and upgrading VMware Tools on Linux VMs. To check if VMware Tools is installed on a Windows VM, see Installing and upgrading VMware Tools on Windows VMs. When an environment starts, automatic power options are delayed for 30 minutes to allow all of the VMs in the environment to fully start. If an environment would have been shut down or suspended during this period due to inactivity, the power option is applied to the environment after the 30-minute period is over. When power options are set for an environment, Skytap monitors the VMs in the environment for specific kinds of activity. When activity has stopped for all of the VMs, the environment is considered idle and the power options timer starts. If all of the VMs stay idle until the power options timer elapses, the power option is applied to the environment. There is keyboard or mouse activity in a VM browser client session, sharing portals session, or SmartRDP session. An API script or CLI command checks or makes a change to a VM or the environment (see Using the API with auto-suspend). A VM script sends a “keep-alive” message to the Skytap metadata service (see Sending keep-alive messages from a VM to prevent automatic shutdown or suspend). A signed in user or administrator is viewing the Environment Details page for the environment. A VM in the environment was started (run) within the previous 30 minutes. Skytap also enforces Session Expiration Time to automatically sign out inactive users. Session expiration is independent of automatic power option and is controlled by your administrator. Once users are signed out, any of their browser tabs left open on the Environment Details page are ignored. By default, Skytap does not check for active connections over published services or public IP addresses. To prevent a VM from shutting down or suspending while published services or other unmonitored services are in use, run a script that periodically sends keep-alive messages to Skytap. For instructions, see Sending keep-alive messages from a VM to prevent automatic shutdown or suspend. From the environment page, click Power options. The Power Options dialog displays. Click Enable automatic power settings. The dialog expands to show additional options. Choose a power option schedule. hours – Choose the number of hours to delay the power option. minutes – Choose the number of minutes to delay the power option. The minimum delay for a power option is five minutes. At date and time – Choose the day and time that the power option will be applied. Shutdown – The environment will shut down according to the Schedule settings. The Shutdown action is the default. Suspend – The x86 VMs in the environment will suspend according to the Schedule settings. The Skytap power options feature automatically shuts down or suspends all of the VMs in an environment that support the selected automatic power option. To suspend or shut down a single inactive VM and keep the rest of an environment running, use the VM guest operating system settings to shut down or put an idle VM to sleep. For instructions, see Using guest OS settings to suspend SVM usage for inactive VMs. Alternately, you can put an x86 VM in its own environment (with unique automatic power option settings) and connect it to VMs in other environments (see Networking between environments). Account administrators can set the default power option for all new environments in the account. This helps encourage power option use across environments. For more information, see Managing account-wide settings. Schedules let you automate complex operations on environments and templates. Allowed schedule actions include shutting down and suspending environments (that support the suspend operation). Environments can have both a schedule and an automatic power option configured. The environment will change to the power state change that occurs first. For example, if an environment is scheduled to start at 08:00 and shut down at 17:00, and the environment is also configured to shut down after an hour of inactivity, the automatic shut down action can occur first. When the schedule shut down action occurs at 17:00, Skytap detects that the environment is shut down and leaves it shut down.